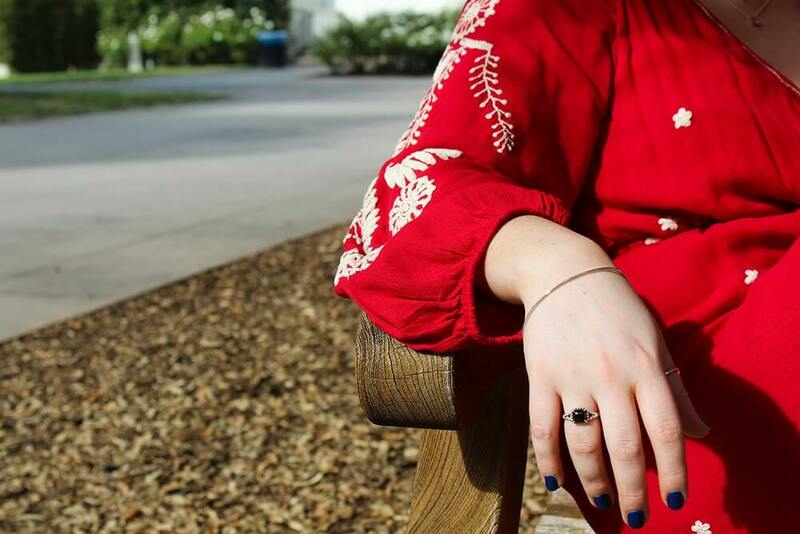 In high school, Emma Kovacs (senior) said she wore sweatpants every day, but upon entering Occidental her first year, she was excited to branch out and start dressing up for class. Students at Occidental dare to take risks and express their own creativity in what they wear to class, according to Kovacs. “Fashion at Occidental is what I perceive to be a microcosm of Los Angeles fashion,” Kovacs said. Compared to other major global cities, fashion in LA is unique: impacted by the presence and history of Hollywood glamour, surf and skate culture. The world-renowned Fashion Institute of Design and Merchandise (FIDM) had its start in Downtown LA with two small classrooms, LA is known as the denim capital of the world and its roots in surf and skate culture inspired many brands created by skaters and surfers, such as Vans and Jolyn, to find their home in Southern California. Emily Davis (sophomore) said the fashion industry in LA has influenced her college experience, drawing most of her style inspiration from collaborating with her friends about fashion in the dorms. Davis grew up in Northern California, noting that oftentimes her friends would point out her stylistic differences based on where she grew up. Over 57 percent of Occidental’s class of 2022 comes from U.S. states besides California, with eight percent of the class being international students. One of the factors Davis noted that causes fashion at Occidental to be so unique is the geographic diversity of the student body. Through a brief glimpse at the student body during the lunch rush at the Marketplace, it is apparent that many students use their unique LA street style as a form of personal expression, Anna Calloway-Jones (sophomore) said. Fashion, for students, is a very personal form of expression, acting as a way to emphasize and express individuality. Within LA itself, there are many different styles and trends, according to Ever Avery (sophomore). Originally from Hermosa Beach, Avery said the style in his high school was primarily reflective of Southern California surf culture, with people typically wearing Vans, a Hurley t-shirt and a snapback. Avery described Eagle Rock’s aesthetic as trendier and representative of more gentrified areas compared to his hometown due to the art and music community in Eagle Rock. “Everybody gives LA a bad rap when it comes to fashion, but I disagree. I think LA has great fashion,” Avery said. Migrating from New England to Southern California, Pierce DiMauro (junior) said that he finds himself wearing less bulky layers due to the more temperate climate. DiMauro sees fashion as a medium that many students take advantage of to portray their own diversity and individualism on campus. When attending high school, many Occidental students, including Davis and Wakefield, were required to wear a school uniform every day. Wakefield said she finds her inspiration through other people’s style at Occidental, citing college as the time for personal style discovery after so many years of having a required uniform during the week. Both Wakefield and Davis said that the only opportunity they had to experiment with fashion and dress up in high school was on the weekends. Fashion does not just reflect the student body at Occidental; many faculty have had careers in the fashion industry or are still involved today, including adjunct public health professor Nicole Vick. Vick has run a fashion blog, Style VickSen, for the past two years and believes that the unique nature of LA fashion is due to the consistently sunny weather year round. Vick described the LA fashion prototype as “casual chic”: a hybrid between laid-back beach style and the glitz and glamour of celebrities on the red carpet. This juxtaposition ultimately leads to what Vick sees as the staple LA look: blue jeans, a leather jacket and a great pair of sunglasses. The fashion and beauty industry runs deep for Vick’s family, her great-grandmother worked as a beautician on South Central Ave, and her aunt owned a small cosmetics company called Jan of California. Vick said her initial inspiration for starting her blog came from the casual sharing of her nails and outfits with friends over Instagram. As a little girl, Vick said she was surrounded by bottles of nail polish left around the house and drew inspiration by looking through old family photos of her grandmother. LA fashion is influenced by bloggers and influencers such as Vick, but also widely impacted by Hollywood glamor and the film industry. Dean Lin (senior) is currently a Media, Arts & Culture (MAC) major focusing on a different side of film than simply red-carpet style: production. Lin said he has witnessed the relationship style holds through interning in the film industry. In film production, people in different positions dress in distinct ways. People working on sets usually dress with a construction aesthetic involving cargo pants and work boots, while people working on the corporate side of film dress in more traditional business attire. Lin noted that the distinction of clothing determines power and role. Through working at various internships, Lin said he could tell the difference between production companies and work environments based on how his co-workers dressed. Recently, Lin has noticed companies opting for a more relaxed and casual dress code — encouraging personal style to be explored. This aspect and emphasis on individuality at work has influenced where Lin hopes to work following graduation. “I think people are more comfortable showing their style at work,” Lin said. Kovacs said she noticed a difference in business casual fashion between her east coast hometown of Boston and LA. Through experience interning in both cities, Kovacs said Boston tends to be a bit more formal in the workplace, compared to LA, where many people wear jeans to work. “How people perceive you in a professional environment is different than on campus,” Kovacs said. Lin is from New York City and noticed his style shift significantly between high school and college. One main difference Lin has observed between style in New York City and Occidental manifests through a particular clothing item: Nike Air Force 1. Lin said the shoe exemplified a difference in brand identity and staple clothing items, as the shoe style is exceedingly more popular in LA despite both cities being known as hubs for fashion. Lin attributed his changing style to the vast seasonal differences between New York City and LA. He noted that a unique factor of LA fashion is how celebrities and people transition from dressed up for the red carpet to a casual, beach look. In the past year, Kovacs has branched out by venturing to Goodwill for the first time. Kovacs has seen a lot of clothing exchanges and swaps within her time as a student at Occidental and attributes the popularity of thrifting on campus to the college’s overall sustainability. “The mindset [of Occidental students] towards nurturing the environment, I think that people definitely incorporate that into their clothing style,” Kovacs said. Thrifting and digging through the Goodwill Outlet, colloquially known as “the bins,” is a popular pastime among Occidental students and their friends, according to Lin and Kovacs. Avery likes to get all of his clothes secondhand because he feels it adds a uniqueness to his style. Avery said he pretty much exclusively shops at the Assistance League near his home and the bins. “[Thrifting is] good for the environment and more ethical,” Avery said. When experimenting with new styles, one can either buy fast fashion or buy from a thrift store and donate it back later, Avery said. The term fast fashion is used to describe buying something trendy and cheap from department-style stores, often manufactured in offshore workshops, and then disposing of it a couple months later, resulting in great numbers of waste. One way to protest environmental pollution and the fast fashion industry is to invest in expensive yet ethically-made wardrobe and statement pieces that will last for decades. Yet, it is not economically attainable for college students to invest in these kinds of pieces, Avery said. Fashion and style among students at Occidental are dependent upon subculture, Avery concluded. This concept of free expression in student’s fashion choices is a general reflection of Occidental as a liberal arts college, Kovacs said. LA incorporates casual beach streetwear with the influence of the Hollywood film industry to create its own fashion persona different from any other city in the world. The combination of influence from beachwear and glamour, in addition to efforts to remain economically and environmentally conscious, is reflective in how Occidental students develop their own unique styles.